Roger Tsien was one of the most productive and creative contemporary chemists. He’d been awarded the 2008 Nobel Prize in Chemistry “for the discovery and development of the green fluorescent protein, GFP”, together with Martin Chalfie and Osamu Shimomura. GFPs enable researchers to watch live cells at work: If they’re interested in a certain protein that can be expressed by an organism, they can fuse the GFP gene with the protein-encoding gene. From now on, each protein molecule can be traced through all its stages with the help of blue to ultraviolet light via fluorescence. 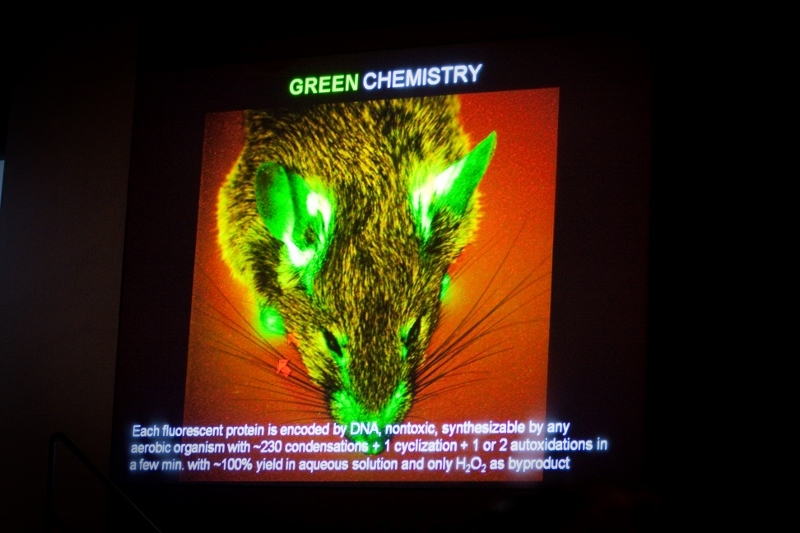 The advantage over many other markers is the fact that GFP is non-toxic, and also the light to see its fluorescence is non-toxic. GFPs have been widely used in many species, from yeast to insects, fish and mammals, as well as in human cells. The original GFP molecule was discovered in the jellyfish Aequorea victoria. This is why Roger Tsien thanked the jellyfish in his banquet speech at the official Nobel Prize Banquet Dinner on December 10th, 2008: “So my final thanks are to both the jellyfish and corals: long may they have intact habitats in which to shine!” Some of the fluorescent dyes developed by his research group were also derived from corals, others from bacteria. Already as a PhD student of physiology in Cambridge, UK, Roger Tsien had developed his first tracking dyes for calcium activity in living cells. He hadn’t told his PhD supervisor about his new research adventure because he was sure that he would only explain how important it was to finish one project before starting a new one. Some of these dyes are still used today, like BAPTA and Fura-2; the latter was developed when Tsien had already become an assistant professor at the Department of Physiology-Anatomy at Berkeley. 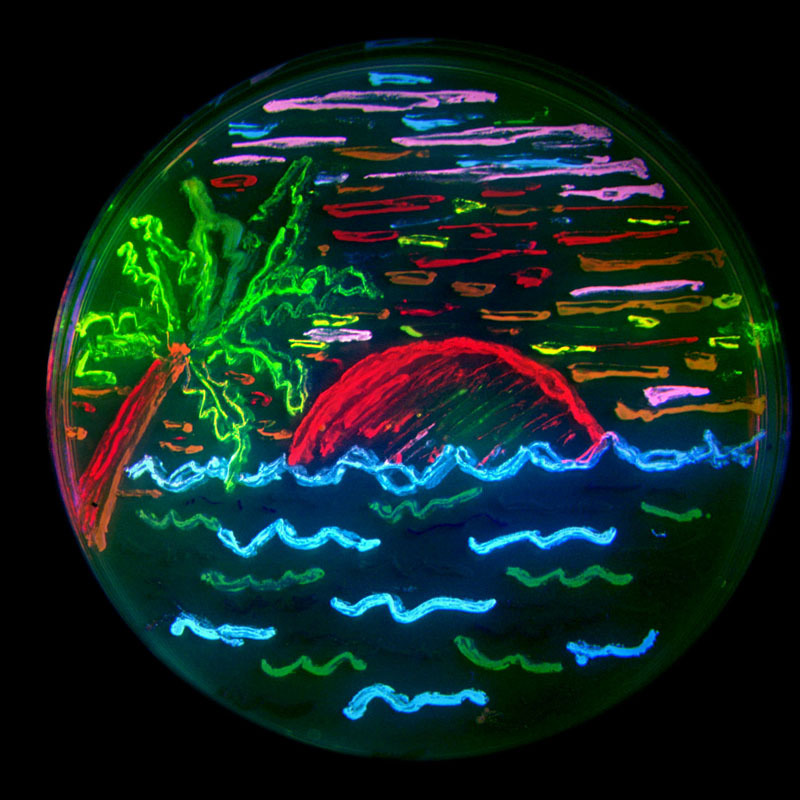 After his move to UCSD in San Diego in 1989, mostly for better lab equipment, the Tsien group found fluorescent indicators that “glow in all colours of the rainbow”, as the Nobel Prize committee wrote. 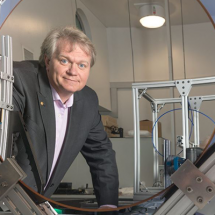 Over the years, his research group has also developed fluorescent indicators for ions like magnesium, copper, iron, lead, cadmium, and many more. Roger Tsien’s father was an aviation engineer with a degree from MIT, but couldn’t find a suitable job because as a Chinese, he didn’t get the necessary security clearance. After several different jobs, he found work in the vaccum tube division of RCA, Radio Corporation of America, in New Jersey. When his parents wanted to buy a house in New Jersey, the developer wouldn’t sell it to them because they were Chinese, fearing that other families wouldn’t buy property next to them. His parents wrote to the New Jersey governor to complain, and the governor in turn wrote to the developer that racial discrimination was illegal. Not only could the Tsien family then buy the house – years later, the same developer used Roger’s photo as the winner of the nationwide Westinghouse Science Talent Search to advertise how good the Livingston schools were. Only sixteen years old, much younger than most other contestants, Roger Tsien had written up his results from an NSF-sponsored summer programme at Ohio University that he had attended in the summer of 1967, his “first exposure to a research environment”. He was assigned a project where he had to analyse how metals bind to thiocyanate. “For lack of any alternatives, I wrote up my Ohio University project, trying my best to draw some conclusions from a mess of dubious data.” To his own surprise, Roger Tsien won the first prize. The same year, he started college at Harvard University with a scholarship, where he earned a Bachelor of Science in chemistry and physics, followed by a PhD in physiology from the University of Cambridge – and a productive career in the lab discovering and applying fluorescent dyes. 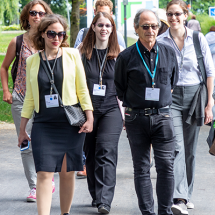 Roger Tsien came to five Lindau Meetings, and the five lectures he gave demonstrate his wide interest in many scientific topics. In his 2015 lecture for instance (see above video), he explains his recent interest in two seemingly very different research areas: cancer therapy and long-term memory storage. But interestingly, both topics touch upon the same enzymes called proteases: enzymes that can cut proteins. Tsien himself explains his motivation for cancer research with the fact that his father died of pancreatic cancer. Together with medical doctor Quyen T. Nguyen he developed ‘fluorescence-guided surgery’ that helps the surgeon not only to find most cancer cells around a tumour, but also to preserve as many nerves and other important structures as possible. The second topic of his 2015 lecture concerns memory storage in the perineuronal net, or PNN, an extracellular matrix structure that stabilises the adult brain. After a lifetime of studying intracellular activities, “here I’m forced to learn about extracellular matrix!” Tsien said in 2015. ‘Holes’ in the PNN act as the storage medium, “like a 3D punch card”, he explains, only to realise that today’s young scientists have never handled a punch card. In a mouse model, he was able to delete many long-term memories with the help of a certain matrix metalloproteinase, or MMP. He expects an even larger deletion share if more enzymes involved are understood. Sounds like the ‘neuralyzer’ from the Men in Black movies that can delete memories, doesn’t it? On August 24th, 2016 Roger Tsien died unexpectedly on a bike trail in Eugene, Oregon, aged only 64. On this day, the world lost a brilliant scientist as well as a wonderful person with a great sense of humour.